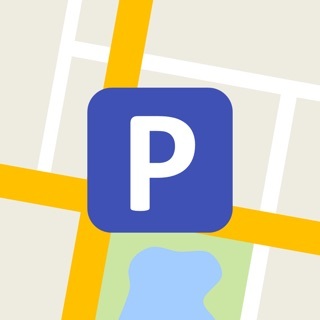 BizMeet or BM for short is a free GPS location sharing app for the iPhone that allows you to share, track, find and display the GPS location of contacts in real-time. It's a fun and simple to use GPS phone tracker that allows you to easily connect with clients, coworkers, friends & family. By utilizing BM's location technology, you can share your location with other BM users at the same time as you can track their locations. So, you always know who is nearby. 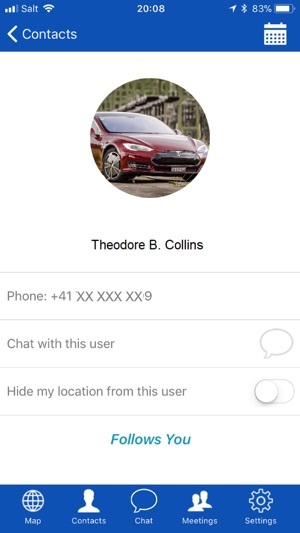 This allows you to connect, catch up and coordinate with other BM users, whether you are at home, out on the town or traveling. BM is your connection companion and GPS locator. It helps you discover contacts that are close by, so that you can quickly set up a spontaneous meeting. We are all busy and BM provides you with the ability to recognize an opportunity to catch up with your connections on short notice, enabling you to reach out and to setup that impromptu meeting at a nearby Cafe, Restaurant or Bar. Not able to connect with a potential client at the trade show? Haven’t seen your favorite cousin or university friend for a while? Waiting for that friend that is always running late? BM tracks and finds their location, so you know their current location and can reach out to them. Just want to make sure your child is on their way home from school? BM finds their location for you in real time; providing peace of mind when checking up on your loved ones. The BM app works accurately and reliably as a family locator, so you can share it with the member of your family as well. 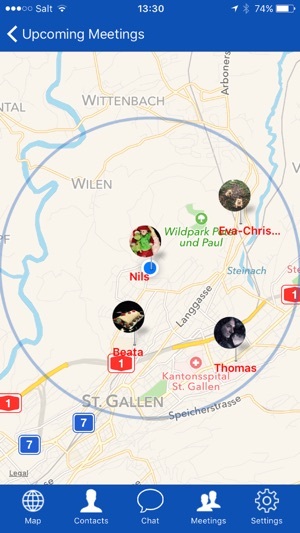 Share & Track Location: The BizMeet Map shows you where your contacts are in real-time and they in turn can see where you are located. Never miss an important connection opportunity! Contacts: BizMeet automatically syncs with your mobile's contact list, so you know which of your contacts are on BizMeet and which are not. Follow: You choose which of your contacts on BizMeet you want to follow and what their proximity to your location should be. Connect: Your client is on BizMeet but they do not have your phone number? 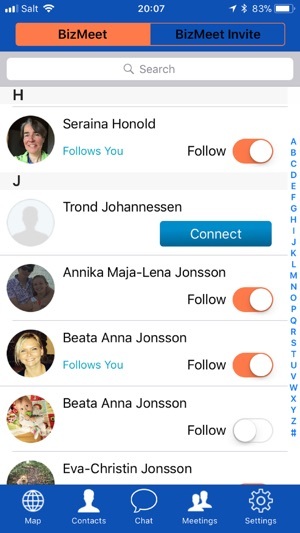 Simply tap “Connect” and they will be alerted to add your number to their contact book. 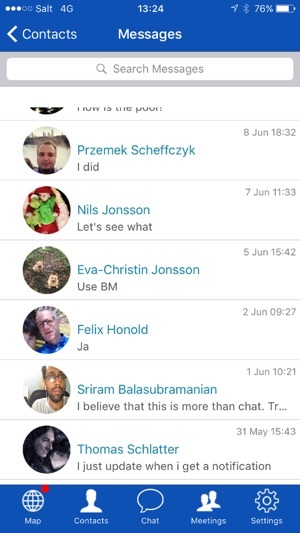 Invite: You see friends, family or colleagues that are not on BizMeet? 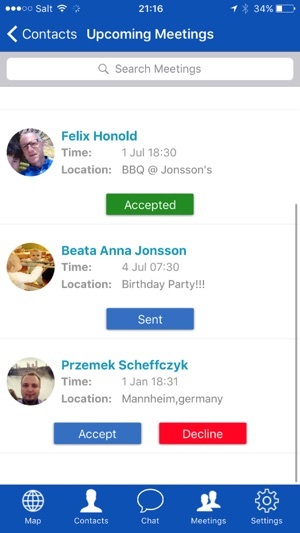 Simply invite them directly from the BizMeet Invite menu under contacts. Communicate: Found a client or friend nearby that you want to meet up with? 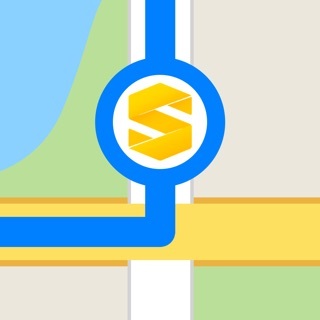 Simply tap their icon on the map and send them a message or a meeting invite. As a convenience feature, BizMeet provides in app messaging for all its users. Meet Up: Want to schedule a quick ad hoc meeting? 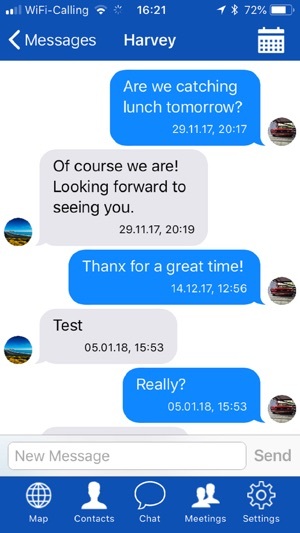 BizMeet provides in-app scheduling, to easily set a time and a place for that impromptu meeting that allows you to catch up or conclude an important business deal. Privacy & Visibility: BizMeet shows you who is following you and puts you in control of who can see you. You can turn off your visibility to others universally, or only for individual users, depending on your personal preferences. Security: Connections are based on your mobile number. Contacts that do not have your number cannot follow, chat or set up meetings with you through BizMeet. A user’s phone number is their ID and if they don’t match you can only send a connection request. This ensures that only those contacts you know about and want to be followed by can do so. BizMeet brings you value however you want to use it. Download BizMeet today! BizMeet is currently available in the following languages: German, English, Polish and Swedish. **Note**: As with any location based services app, the continued use of location based services running in the background impacts battery life. The app works great in real-time, it’s cool how you can easily see contacts moving along a path. I use it with friends and family as well as with clients in business. You also get a lot more functionality for free than other similar apps seem to be offering. Requires iOS 11.0 or later. Compatible with iPhone, iPad Air Wi-Fi + Cellular, iPad mini 2 Wi-Fi + Cellular, iPad Air 2 Wi-Fi + Cellular, iPad mini 3 Wi-Fi + Cellular, iPad mini 4 Wi-Fi + Cellular, 12.9-inch iPad Pro Wi-Fi + Cellular, 9.7-inch iPad Pro Wi-Fi + Cellular, iPad Wi-Fi + Cellular (5th generation), 12.9-inch iPad Pro Wi‑Fi + Cellular (2nd generation), 10.5-inch iPad Pro Wi‑Fi + Cellular, iPad Wi-Fi + Cellular (6th generation), iPad Pro (11-inch)Wi-Fi + Cellular, iPad Pro (12.9-inch) (3rd generation) Wi-Fi + Cellular, iPad mini (5th generation) Wi-Fi + Cellular, and iPad Air (3rd generation) Wi-Fi + Cellular.